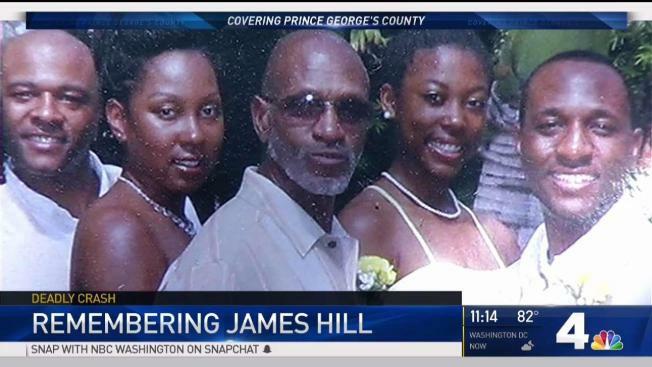 Days after a Maryland father was killed in a car crash in Accokeek, Maryland, his family is desperate for information about what happened. James Hill was on Indian Head Highway, on his way home from work when a Ford smashed into his minivan at Pine Drive. Police responded about 8:50 p.m. Hill died soon after. He was 67. The active cyclist and runner used to text his wife, Mary Elizabeth Hill, every morning to say he had made it work safely and every evening to say he was headed home, she said Sunday. On Thursday, Mary Elizabeth Hill never got a text from her husband saying he was on his way home. She told her daughter knew something was wrong. "I told her, 'We need to go find Daddy,'" she recalls, her voice cracking. The mother and daughter headed to the Beretta factory, where Hill worked security, to see if his car was still there. They met heavy traffic. "That's when we saw his car. And I knew he was gone. I knew he was gone at that time," Hill's widow said. Prior to the crash that also involved a third car, witnesses told police they saw several drivers speeding and driving recklessly. Drivers often speed on Indian Head Highway, people who frequent the road say. The crash remains under investigation. The driver of the Ford received non-life-threatening injuries. Whatever the outcome, the family says they already know what they lost on the notorious stretch of road: the attentive uncle, the father who made dishes that were family legends and the husband who never left home without telling his wife he loved her. Anyone with information on the crash is asked to call 301-731-4422. Callers who wish to remain anonymous can call 1-866-411-TIPS, text PGPD plus your message to CRIMES or go to www.pgcrimesolvers.com.